State weather forecasters announced the new potential cyclone located at East of Mindanao. 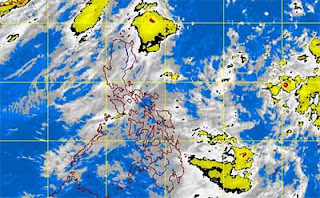 PAGASA monitor the approaching LPA in the Philippine Area of Responsibility (PAR). PAGASA weather bulletin as of 11 am today, "Southwest Monsoon still affecting Luzon and the Low Pressure Area (LPA) was estimated at 580 km East of Hinatuan, Surigao del Sur." So far, PAGASA reported that LPA has no direct effect on the Philippines, adding that the rain over Metro Manila and nearby provinces early Thursday was due to the southwest monsoon (Habagat). Today, PAGASA advised fishing boats and other small seacrafts not to venture out into the sea while larger sea vessels are alerted against big waves. Comments or suggestions about "New LPA located at East of Mindanao | PAGASA Weather Update August 23, 2013" is important to us, you may share it by using the comment box below.